Aviation expansion could threaten UK wildlife and lead to rocketing greenhouse gas emissions. That’s the message from the RSPB after the Government launched its consultation on the environmental impacts of aviation today [Thursday 12 July, 2012]. Aviation is the fastest growing source of greenhouse gas emissions in the UK, with this country already one of the world’s biggest producers of carbon per head through air travel. By 2050 aviation could account for one quarter of the UK’s total greenhouse gas emissions. Yet there are no targets to reduce this, and these emissions are still not counted in UK’s carbon budget system. What’s more, the consultation confirms that new and expanding airports are on the horizon, which would see emissions rise to alarming and unacceptable levels, and may threaten valuable wildlife habitats such as the Thames Estuary. Chris Corrigan, RSPB South East Regional Director, said: “Today’s announcement confirms Government’s continued pursuit of economic growth regardless of the cost to people, wildlife and our environment. Ultimately, this will only stoke the flames of opposition and cause needless damage to our fragile environment. The RSPB is calling for a new approach that properly values the environment and ensures that unbridled growth in aviation does not undermine our climate. “Climate change is the greatest long-term threat facing birds, wildlife and people. If we don’t act now to limit our emissions, we’re putting our special places and species at grave risk as well people’s homes and livelihoods. “The government has also delayed consultation on the economic arguments for a hub airport until later this year, and in doing so has harmfully segregated the debate. We cannot consider the economic arguments for expansion and specific hub proposals without taking into account the environmental impacts such as noise, pollution and climate change. The RSPB is Europe’s largest conservation charity, working to save and support the UK’s urban and rural wild life and wild places. With more than a million registered supporters, we speak out for nature, champion development which brings economic growth alongside a healthy environment for people and wildlife, and aim to bring people closer to nature. www.rspb.org.uk/london. Aviation and our climate Domestic and international aviation emissions amount to about six percent of the UK’s greenhouse gas (GHG) emissions. This represents 21 per cent of the UK transport sector’s GHG emissions and compares to 43 percent of transport emissions emitted by cars. Aviation’s emissions have grown substantially in past decades, doubling from 16.9 million tonnes of CO2 in 1990 to 34.7 million tonnes in 2009. This reflects the demand for aviation growing faster than fuel efficiency improvements (Source: Department for Transport, 2011). Aviation emissions are increasing rapidly and in climate-warming terms are at least twice as damaging as other emissions, meaning their impact is substantially greater. This is because nitrogen oxides, water vapour, soot and contrails all lead to additional warming, especially when released at high altitude. To limit the impact of aviation on our climate, Government will need to halt air travel expansion until it can be demonstrated that we can keep emissions from flying to within those needed to reduce the UK’s emissions by 80% by 2050, as enshrined in law by the Climate Change Act (2008). Without this, the scale of the cuts required in the rest of the UK economy to offset a continuing rise in aviation emissions would be potentially crippling. Instead, demand for flights can be managed by encouraging the use of lower carbon modes of transport and removing the substantial subsidies that the industry currently enjoys such as tax-free fuel, and the absence of VAT. · Building an airport in the estuary would be an act of environmental vandalism. · It’s home to hundreds of thousands of birds and welcomes hundreds of thousands more on migration every year. 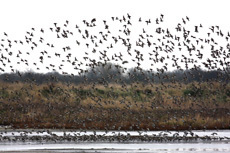 Aviation industry experts estimate the likelihood of bird strike with aircraft is 12 times more likely within the estuary compared with any other UK airport. · The estuary is unique and so large that it could not be recreated anywhere else in Europe, so mitigation is not possible. · The argument for a massive increase in aviation capacity cannot fit with the UK Governments targets to reduce emissions. Find out more about our work in London by visiting our blog page, or follow us on Facebook. The Government has once again disappointed on climate change but there is much else to welcome, although its strategies on quality of life considerations have been left far too open to interpretation – was the response from AirportWatch (AW) to the Government’s draft aviation policy published today. AW, the national umbrella organisation opposing unsustainable airport expansion, said that the Government needs to act much more forcefully towards adopting the Committee on Climate Change’s advice to include aviation (and shipping) emissions within the Climate Change Act targets and to return aviation emissions to 2005 levels by 2050. The group particularly welcomed the move to devise an overall framework before considering detailed proposals to increase capacity. A consultation on capacity would be completely invalid without first taking into account environmental and quality of life considerations, they said. The group stressed that the Government must not automatically assume that further airport capacity is needed when its own forecasts show there is currently enough capacity, even in London and the South East, until at least 2030. Requirements for capacity after that date would require further evidence on future oil prices, climate change targets, the impact of business trends towards videoconferencing and the EU Emissions Trading Scheme (ETS). However, the group broadly welcomed the Government’s recognition of the tourism deficit*, the numbers of people affected by aircraft noise, particularly at Heathrow, reassessment of how noise disturbance is measured, raised fines for airlines in breach of noise regulations, commitment to optimise airport slots and that biofuels may not be the solution to aviation emissions. “The Government’s aviation strategy document is showing some willing to address quality of life issues around which any national aviation policy must be framed but has fallen down badly when it comes to climate change considerations. Unfortunately the impacts of climate change are likely to define all our futures, which is why any aviation strategy must be robust on this issue. “The Government must remain firm in the face of siren calls from the vested interests of the aviation industry to increase capacity at any costs when there is currently no genuine evidence that the UK will be struggling in the next two decades. The UK is now one of the best connected countries in the world with direct connections to over 360 international destinations. 1] Aviation accounts for at least 13% of the UK’s greenhouse gas emissions (if radiative forcing is included – about 6.5% without it). Radiative forcing caused by jet emissions high in the atmosphere is recognised by the Intergovernmental Panel on Climate Change as causing more effect on climate due to non-CO2 effects (NOx and water vapour) – about twice the effect of CO2 alone. By 2050 could account for one quarter of the UK’s total green house gas emissions. 8] AirportWatch is an umbrella movement uniting the national environmental organisations, airport community groups, and individuals opposed to unsustainable aviation expansion. Its members and supporters include the Aviation Environment Federation, Friends of the Earth, Greenpeace, the Campaign to Protect Rural England, the Campaign for Better Transport, the Woodland Trust, the World Development Movement, Action Aid, the National Trust, the Royal Society for the Protection of Birds – and many more. A key aspect of this will be to keep aviation emissions in 2050 at the 2005 level of 37.5 million tonnes of carbon dioxide (CO2) as recommended by the Government’s own Committee on Climate Change (CCC) and to include aviation emissions in the UK’s national carbon budgets. SSE will also expect the Government to fulfil its promises at a local level by adopting policies to reduce the impacts of airports upon the local environment and local communities. Posted: Friday, July 13th, 2012. Filed in General News, News about Airports, Recent News.